Jacobean design influences are abundant in Kathy Brown's newest fabric collection. These traditional prints and rich color palette combine to make Abigail an ideal choice for any home d�cor project. 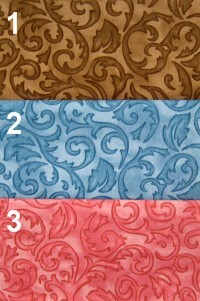 Imagine using the elegant, theme floral for swag valances trimmed with the multicolor, shaded stripe. Use the smaller, secondary floral to make coordinating boudoir pillows tufted with pin-dot covered buttons. Delicate, medallion-style motifs are reminiscent of delicate ironwork or fleur-de-lis' giving this print a decidedly French flair.